With BlogEngine.NET 1.5 RC being made available, I decided to update the installation screencast and a few of the database setup screencasts that commonly follow. If you have questions or are running into problems, please check out the BlogEngine.NET forums. There are lots of helpful people there and tons of great information available. 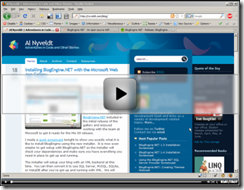 Good luck with your BlogEngine.NET installation.